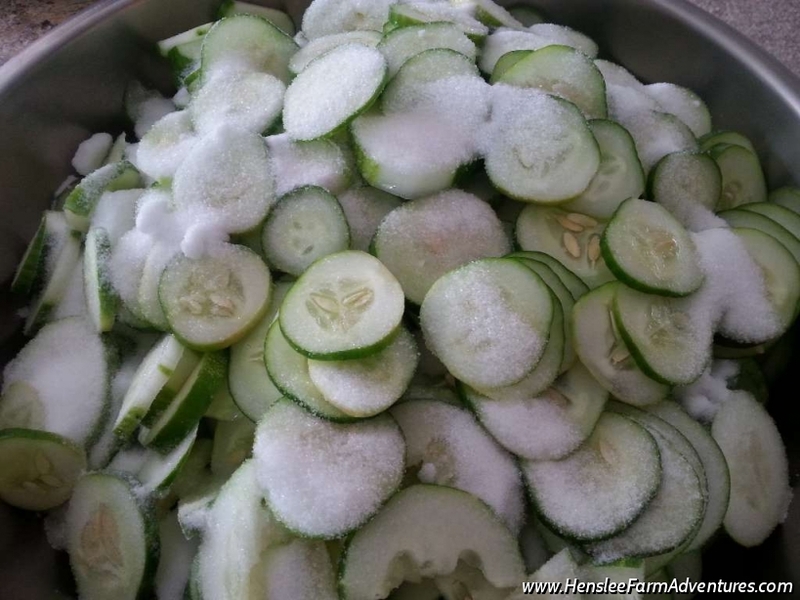 Growing up, my mom would always make what she would call Refrigerator Pickles with the excess cucumbers we grew. I loved these pickles! Later on, I learned that they were basically just Bread and Butter Pickles. The only difference is that my mom wouldn't can them. 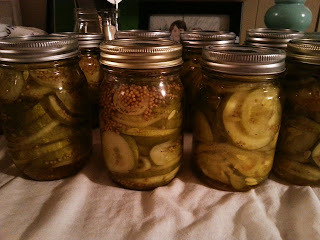 She had a half gallon glass jar that she would save just especially to make her pickles. What is great is if you don't feel comfortable canning, you can always whip up a batch of these and put them in the fridge. 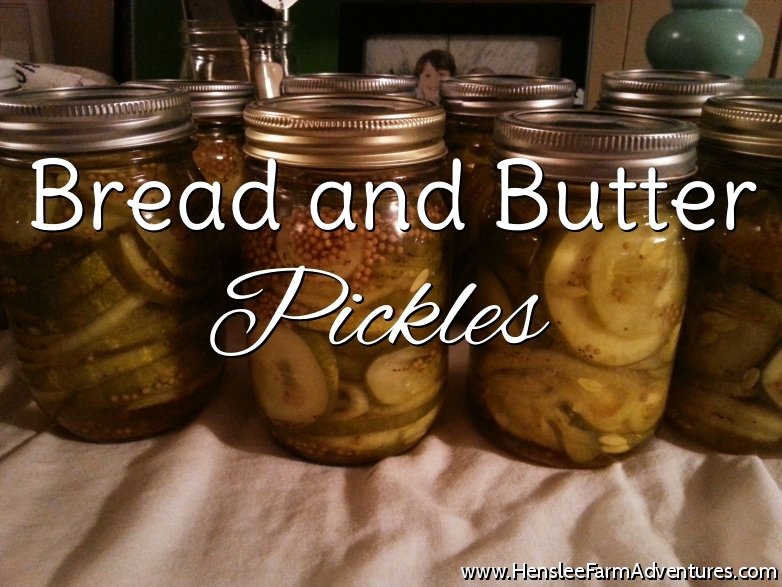 I have also seen recipes for dill versions as well as my favorite sweet and spicy! All of these can be put into the fridge to eat on. They can last for several months in the fridge. My mom's recipe says 9 months. I have seen other recipes say 6 months, and some say 3. I guess it depends on the type of pickle you are making. So back to the recipe. As I mentioned in my Fried Green Tomatoes post, our garden is not doing that well. I have been able to pick a few cucumbers, but not enough to be able to can. Lucky for me one of our wonderful neighbors shared with us some of his cucumbers. In fact he shared so many cucumbers that I decided to make a batch of pickles. Now I already had dill, lime, and sweet and spicy in our pantry, so I thought I would get out my mom's recipe for Refrigerator Pickles and can them. So without further ado...here they are. I did need to wash off the cucumbers, they were just slightly dirty. They looked so pretty in my sink, I couldn't help but get a shot of them. Just in case you were wondering, the picture above only shows a portion of the amount of cucumbers we were given. Our neighbor was very generous! After I washed them, I trimmed the ends and then sliced them. This is where a mandolin slicer comes in pretty handy! After slicing, you will need to put them in a non-reactive bowl. I am using a stainless steel bowl, or you could use a glass bowl. Let them sit for a couple of hours at least and draw off moisture. While I was waiting for this process, I went ahead and sterilized my jars, washed my lids, and began cooking the liquid. I completely forgot to take a picture of the liquid cooking, but you just mix together the vinegar, sugar, mustard seeds, celery seeds, and turmeric and bring to a boil. Once it comes to a boil, lower heat and let simmer till ready to use. 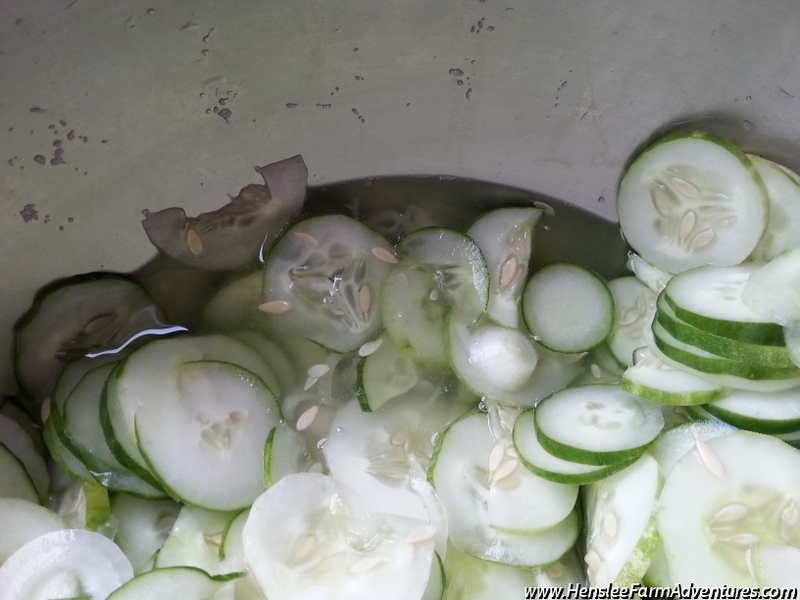 After the two hours, you will need to drain off the water and rinse the cucumbers. I did this in small batches. Once drained and rinsed, then pack the jars with cucumbers. Pour the vinegar/sugar liquid over the cucumbers and remove any air bubbles. 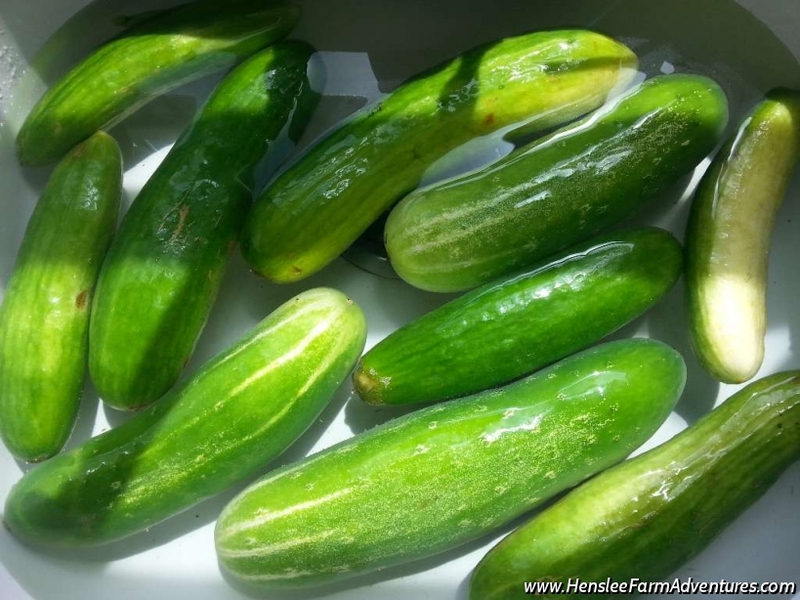 Adjust with more liquid or cucumbers to within 1/2 inch of head space. Finish by processing for 10 minutes in a water bath canner. I doubled this recipe because of the amount of cucumbers I had and ended up with 16 pints of pickles (say that 5 times fast). Can't wait to eat these with brown beans! I am going to let them sit for a week or two, just to make sure that all the flavors meld together. But as they sit on my buffet table, it is hard for me to walk past them without opening a jar! To get the printable version of this recipe click HERE. 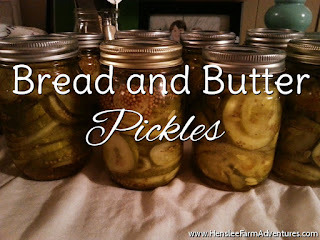 Let me know what you think about the recipe, and let me know what your favorite kind of pickle is.